By Bill RodgersAn actor who was arrested last week on a charge of aggravated DWI has apologized for his behavior toward police during the arrest. Studi goes on to say that, despite his behavior, the Santa Fe Police officers were professional. He states he “deeply respects” and appreciates that. By Roscoe PondAccording to the official website of KOB 4 News. Here are several of the immediate comments from New Mexico individuals after Wes Studi's apology. (Spelling & sentence structure corrected for readers). For more on Wes Studi, see Wes Studi Arrested for DWI and Wes Studi Supports Gay Marriage. Notice how the clip is micro-managed and narrated. Studi will pay his due in time, self regret and money, so all celebs being fair game. 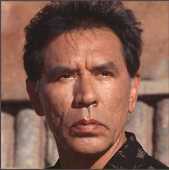 This is nothing and that was not Wes Studi. That was a drunk. No different than the drunks we all have within our own lives be it our fathers, uncles, brothers, nephews, natives, Mel Gibson and/or ourselves. US Presidents have been drunks, so a native actor is no shock or something new. We just have America to impress and trust me, America is full of drunks and racists before and after Wes Studi.